Think you have to go all the way to Coney Island or the Jersey Shore to hit the beach? Not anymore, thanks to Newport Green, a new urban beach and park that was unveiled this summer in Jersey City. We've written about this exciting new recreational space - which happens to be the first and only beach on the Hudson - before, but wanted to visit ourselves to get a feel for how truly accessible it is (just 20 minutes away from downtown Manhattan). Click through our slideshow to see everything you're missing out on if you haven't yet checked out this incredible new destination. Newport Green was developed by the LeFrak Organization and designed by award-winning Mathews Nielsen Landscape Architects, who also worked on the Tribeca section of Hudson River Park. Until now, Jersey City had been seriously hurting for green space and many felt that the area was not friendly for kids and visitors despite its amazing views of Manhattan. Now Jersey Cityites have a welcoming beachfront park to call their own as well as 8,000 square feet of sand to sink their toes into. But the beach is just the tip of the iceberg. Newport Green also boasts a 17,000-square-foot playground complete with a mini-waterpark, water-sprayers, a splash pad and multiple water-dump buckets. And let’s not forget the four different jungle gyms and roped-web climbing dome, which is the first of its kind on the east coast. While the little ones splash around, the adults can stroll through a series of theme gardens that honor the area’s native plantings. Stop by the fragrance garden for a whiff of the most aromatic local flowers, the butterfly garden to chase some winged beauties around or visit the rose bushes to stop and smell the, well, you know. If you’re more interested in sports, there is also a 30,000-square-foot field with an eco-friendly turf surface made of natural plant fibers that retain moisture and prevent overheating. Since the oval-shaped field was designed for multiple purposes, you can organize games of baseball, soccer or just use the field to get in a quick jog. If you haven’t yet been to Newport Green, we highly recommend that. It’s just a quick hop, skip and a jump from NYC and when you arrive you can do all three while enjoying a phenomenal view of the Hudson. I WAS FORWARDED THIS SITE BY A FRIEND...THE NEWPORT GREEN LOOKS AWESOME, BUT NO MENTION AS TO HOW TO GET THERE? PLEASE POST DIRECTIONS, THANK YOU. Newport Green was developed by the LeFrak Organization and designed by award-winning Mathews Nielsen Landscape Architects, who also worked on the Tribeca section of Hudson River Park. Until now, Jersey City had been seriously hurting for green space and many felt that the area was not friendly for kids and visitors despite its amazing views of Manhattan. 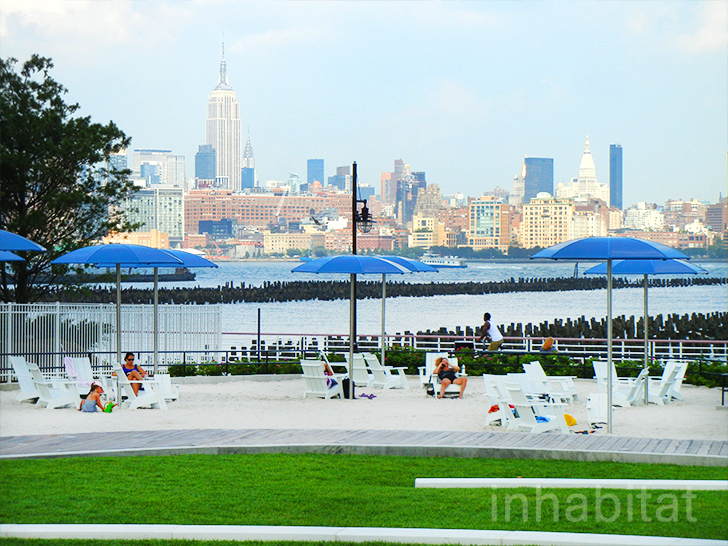 Now Jersey Cityites have a welcoming beachfront park to call their own as well as 8,000 square feet of sand to sink their toes into. But the beach is just the tip of the iceberg. Newport Green also boasts a 17,000-square-foot playground complete with a mini-waterpark, water-sprayers, a splash pad and multiple water-dump buckets. And let's not forget the four different jungle gyms and roped-web climbing dome, which is the first of its kind on the east coast. While the little ones splash around, the adults can stroll through a series of theme gardens that honor the area’s native plantings. Stop by the fragrance garden for a whiff of the most aromatic local flowers, the butterfly garden to chase some winged beauties around or visit the rose bushes to stop and smell the, well, you know. If you're more interested in sports, there is also a 30,000-square-foot field with an eco-friendly turf surface made of natural plant fibers that retain moisture and prevent overheating. Since the oval-shaped field was designed for multiple purposes, you can organize games of baseball, soccer or just use the field to get in a quick jog. The park also acts as a bridge between Newport and Hoboken so that pedestrians can walk from one town to another while enjoying the scenic view. Another one of the park's 4 jungle gyms. There are even colorful loungers for beachgoers to sit back and relax in. There's also a romantic dining area for people who want to bring their own meal. And something we love to see - free WiFi! If you haven't yet been to Newport Green, we highly recommend that. It's just a quick hop, skip and a jump from NYC and when you arrive you can do all three while enjoying a phenomenal view of the Hudson.